Jewel box is a sparkling delight of a quilt, featuring jewel-toned fabrics from Jinny's Palette collection. The green version has border print medallions and a border print border. 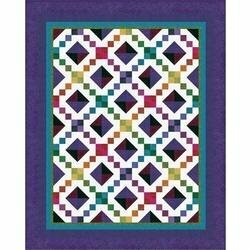 The all-palette fabric version sports scrappy pieced squares and a striped border. The quilt assembles quickly with simple piecing techniques.